A gunman is on the loose after shooting and killing a woman and sexually assaulting others at a Catholic Supply store. ST. LOUIS COUNTY, MO (KTVI/CNN) - A gunman is on the loose after shooting and killing a woman and sexually assaulting others at a Catholic Supply store. A 911 caller reported that the shooter went inside the store and, at gunpoint, ordered all of the women inside to strip, sexually assaulted several of them, then shot one of them in the head, the St. Louis Post-Dispatch reported. Police said the suspect has no connection to the victims. "On these type of cases, we need the public's help," St. Louis County Police Sgt. Shawn McGuire said. 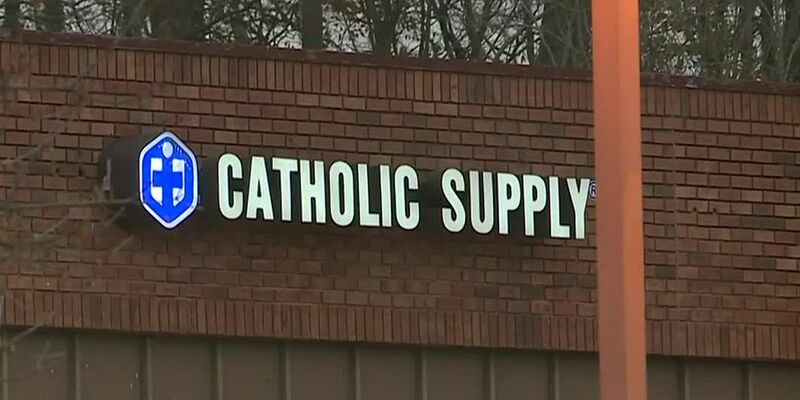 Police got the call for a shooting at the Catholic Supply store around 3:20 p.m.
"A sexual assault did occur inside the store. I don't know how many victims," McGuire said. A customer at the store - Jamie Schmidt, 53, of House Springs, MO - was shot in the head and later died. Police were not sure if the suspect ran away on foot or if he took off in a car. They said he was a white man, 5-foot-7, heavy build, about 40 to 50 years old. He was wearing a navy blue work jacket, a plaid shirt, glasses, blue jeans, a large belt and a paperboy-style hat. Radio station ESPN 101 was broadcasting just a few doors down. "We were shocked when they started putting up the yellow tape up at about 3:15, 3:20. We wondered what was going on. We were here a lot earlier than that didn't hear anything didn't see anything," broadcaster Randy Karraker said. Some people suspect the motive may be a hate crime, an attack on a religion, but police said the motive is far from clear. "It`s very tough to say that this place was targeted based on what type of store was." McGuire said. However, he emphasized that the attack was brazen. “I think everyone needs to be aware this happened at 3:30 in the afternoon on one of the busiest roads in St. Louis County,” he said. Authorities say they don't have surveillance video of the incident, and at this point, they believe the assailant acted alone. Copyright 2018 KTVI via CNN. All rights reserved. Raycom News Network contributed to this report.